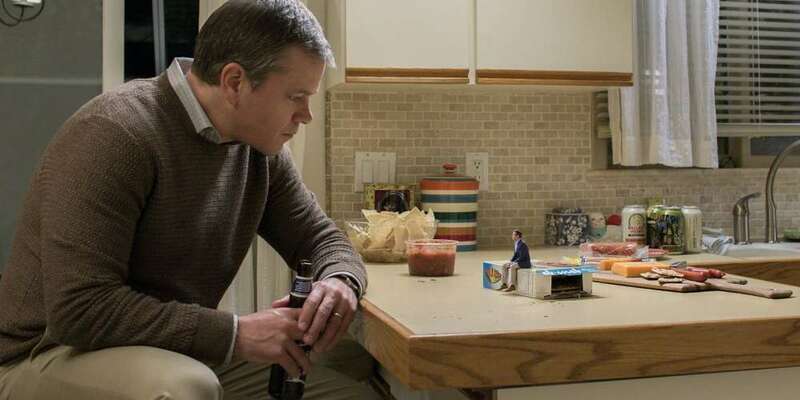 Downsizing is not the rip-roaring comedy its trailer makes it out to be, though anyone walking into this Matt Damon-starrer with that expectation has never before seen an Alexander Payne movie. It’s too long by half an hour, it doesn’t completely work, and though it’s more ambitious in scope than anything this graceful director has done in the past, it’s not in league with his best work (Election, Sideways). Downsizing is minor, and not ironically. 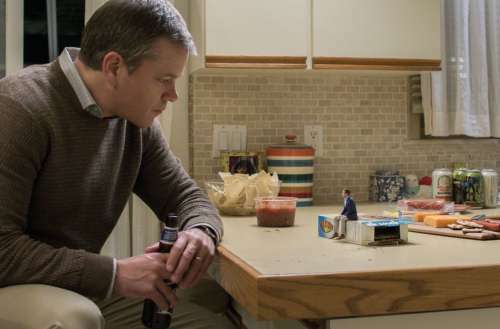 Yet what Downsizing has going it for it is its topical concept — the shrinking of humans to help stave off the ecological disaster of the planet; a typically solid performance from Damon as the beleaguered Paul Safranek; a thoroughly charming depiction by Christoph Waltz as Dusan Mirkovic, a smarmy black market hustler; and a stirring, funny turn by the Taiwanese actress Hong Chau as the headstrong, philanthropic Ngoc Lan Tran (who makes a late entrance into the movie, which lights up when she arrives). 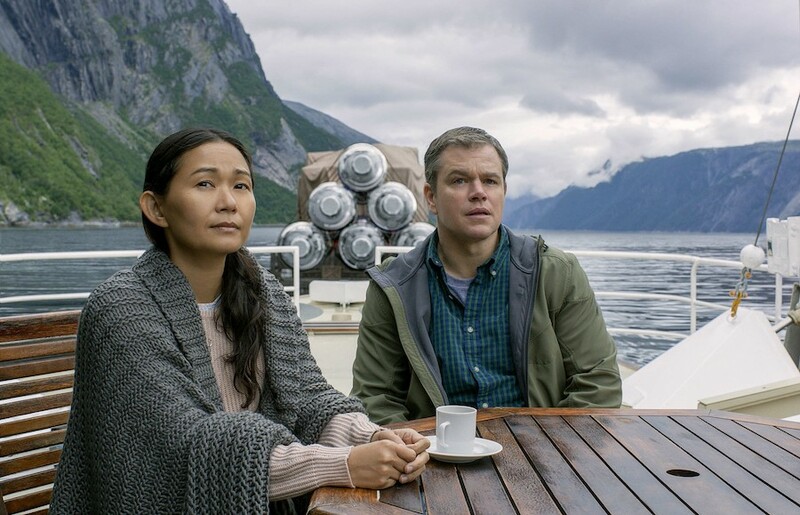 Before Ngoc Lan Tran shows up, there’s a lot of exposition — nearly 45 minutes of it while Paul and his wife Audrey (Kristen Wiig, underutilized and gone too soon) decide to undergo the process of “downsizing” and move to Leisure Land, where the cash-strapped couple’s $160,000 translates to roughly $12 million, and they can live in gaudy suburban palaces while doing their bit for the welfare of the planet. But an eleventh hour abandonment from Audrey leaves Paul tiny and alone, licking his wounds until he meets his effusive neighbor Dusan and, later, Ngoc Lan Tran (who had been forced to undergo the procedure after an act of political rebellion). Payne doesn’t overuse the visual possibilities at his disposal, such as the juxtaposition of large, real world items against the suddenly small humans — though there are a few witty whoppers, including a flower bud that Damon carries to Dusan’s raging party in a full embrace, and the delivery of an enormous (and enormously bittersweet) wedding ring rolled up to the door of Paul’s ugly new Leisure Land house. And Payne doesn’t push his political points of view. They’re embedded in the concept and the Leisure Land community, which has its own haves and have-nots amidst all the (mostly) white inhabitants. There’s also a sly vein of altruism that seeps into the film as it grows darker and more dystopian. What begins with selfish motives — living smaller in order to have more (the benefit to the environment being secondary) — becomes a parable of selflessness that’s as touching as it is unexpected, regardless of the flaws along the way. And Chau, who’s purposeful and undaunted Ngoc Lan harangues Paul from his complacency, is a major discovery. There’s no way to downsize her effusive talent.